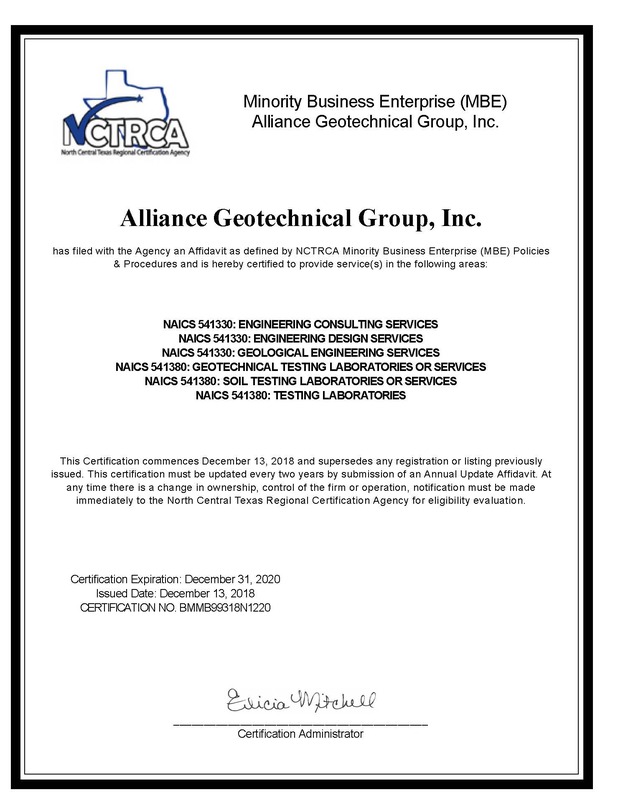 Alliance Geotechnical Group's basic philosophy of excellence and quality in project delivery and client service is undergirded by its management ownership and employee ownership structure. AGG is employee owned. What does this mean to clients? It means that AGG is able to attract and keep the best employees - individuals who are true partners with a vested interest in the outcome of every project. Through this approach, client service moves beyond a business philosophy and becomes the basis of business practice. To support its highly trained and experienced staff of professionals, AGG maintains state-of-the-art equipment, routinely calibrated to support the effort in each service area. The AGG fully accredited laboratory is certified by AASHTO (R18) in concrete, soil, aggregate, and asphalt, meeting the requirements for ASTM E329. AGG's lab is also certified by the U.S. Army Corps of Engineers. 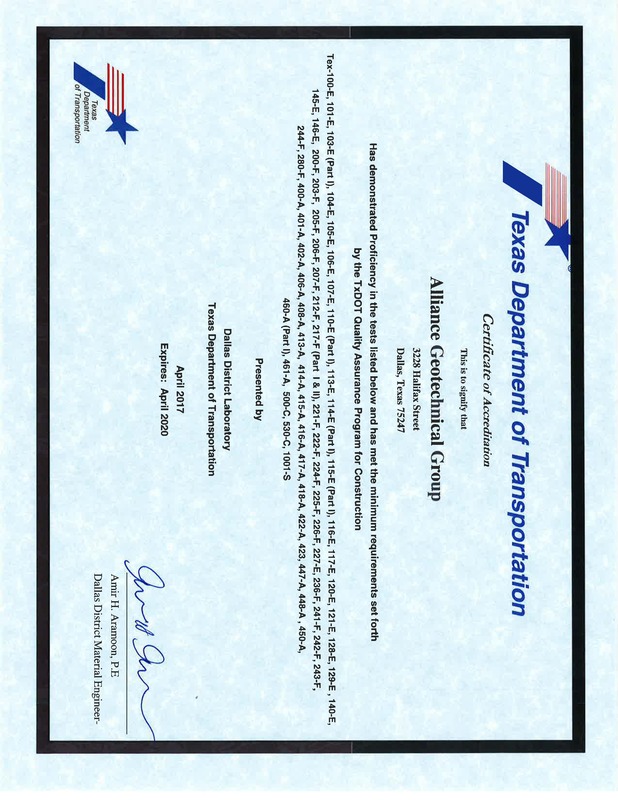 AGG is an active participant in TxDOT, CCRL, and AASHTO Proficiency Sample Programs. 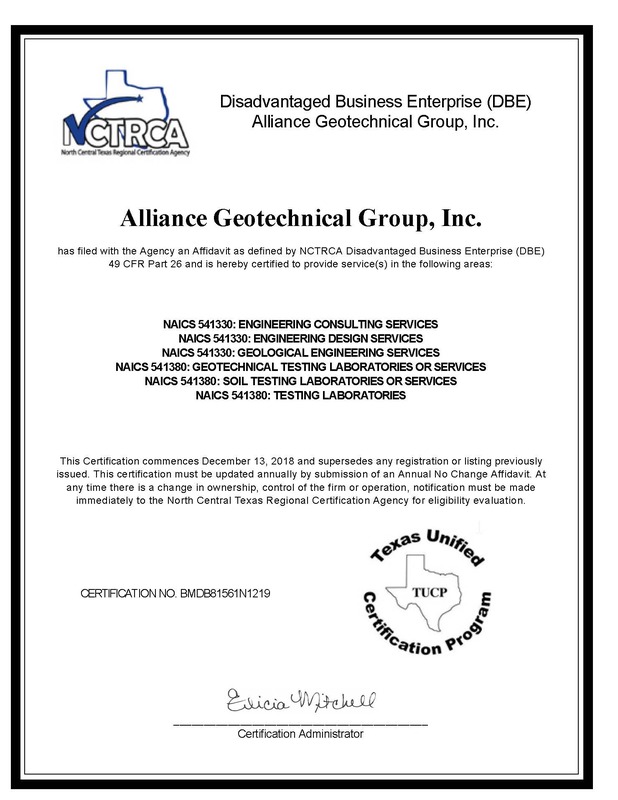 Alliance Geotechnical Group is a member of the Texas Council of Engineering Laboratories (TCEL). 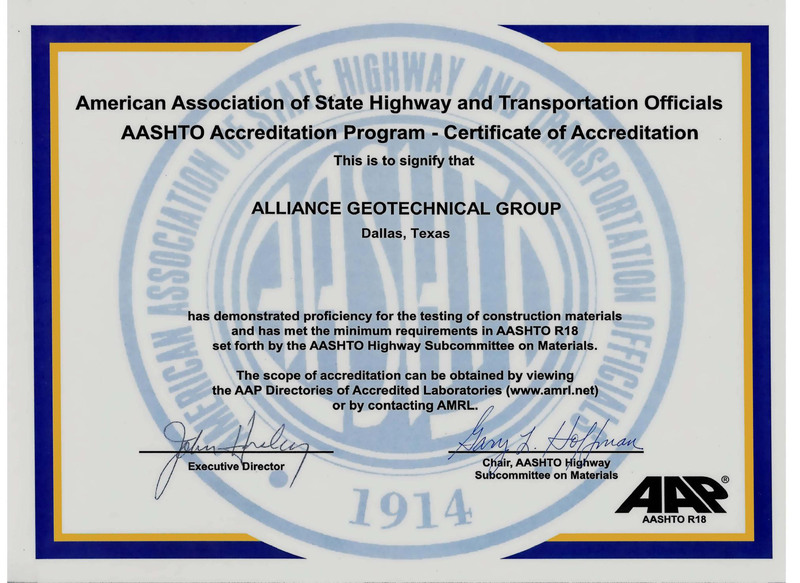 AGG's technicians are certified by the American Concrete Institute (ACI), the National Institute for Certification of Engineering Technologies (NICET), and the TxDOT Hot Mix Asphalt Center. AGG structural steel inspectors are certified by the American Welding Society (AWS), as well as by the American Society of Nondestructive Testing (ASNT). AGG technicians also hold PTI Certification for Post Tension Concrete Structures and PCI Certification for Pre-Cast and Prestressed Concrete Structures. 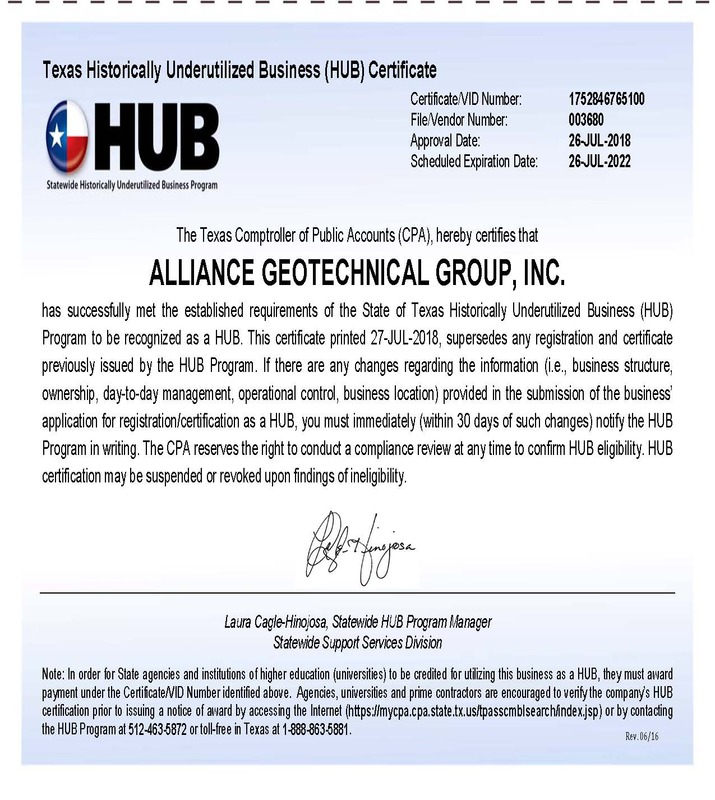 AGG offers special inspectors certified by the ICBO for reinforced concrete and structural masonry - UBC-97 and IBC-2000. The keystone of AGG's practice is its well-developed QA/QC Program. Under the direction of AGG's Quality Control/Quality Assurance Manager, program procedures are monitored on an ongoing basis and all equipment is subjected to stringent inspection regularly.